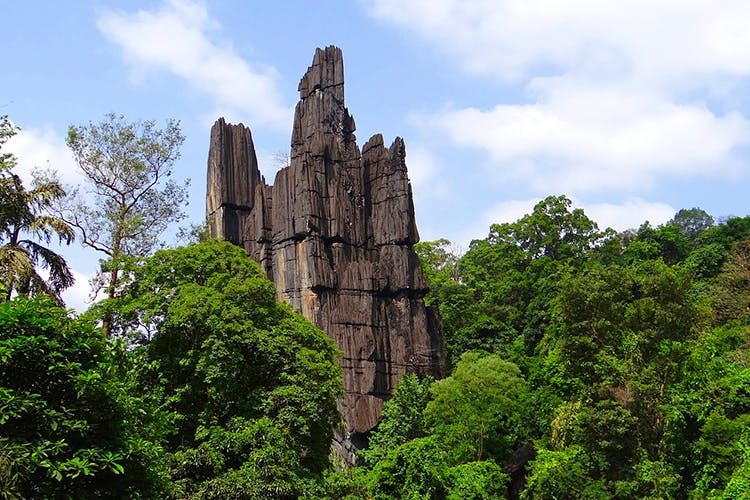 A short drive from Gokarna, Yana is famous for the towering, twin rock formations that bring in visitors by the droves. You can spend a few hours here, weaving your way through lush forests to get to the foothills of the jagged hills. For those of you who are looking to pack in more than just beaches on your trip to Gokarna, Yana is perfect. A little more than an hour’s drive away, Yana was once all forest and rocks. And attracted only the discerning trekker and the pilgrim (there’s a famous Shiva temple here). However, in the past few years, a steady stream of tourists swing by (although it tends to be less crowded than Gokarna itself). Despite that, we recommend stopping by simply to check out the splendid rock formations here. At the entrance, you will have to shell out a small fee to access the hills. Then, take a well-laid out pathway that takes you through a forest area. A couple of kilometres in and the breathtaking rocks will loom in front of you. Said to be formed from black limestone, the twin peaks are marked by vertical ridges. And are unlike anything you have seen around Karnataka. On your way in, you’ll first see the shorter, Mohini Shikhara, and then the higher, Bhairaveshwara Shikhara. At the base of the second peak is a temple dedicated to Lord Shiva. You can then take a muddy path, around the temple, which takes you to the centre of the Bhairaveshwara Shikhara. The open cave formation is well-lit during the day. If you don’t mind all the bat poo lying around, you are in for a memorable experience. You can look up to marvel at the scale of the rock and the blue sky that canopies it. We recommend you come by on a weekday to take in the beauty and the quietness of the forests that’s only interrupted by the chirping of birds.